Just A Card Returns to Top Drawer! Team Just A Card are so excited as this weekend we will be back at the UK’s leading international trade show for design-led lifestyle brands, Top Drawer!! 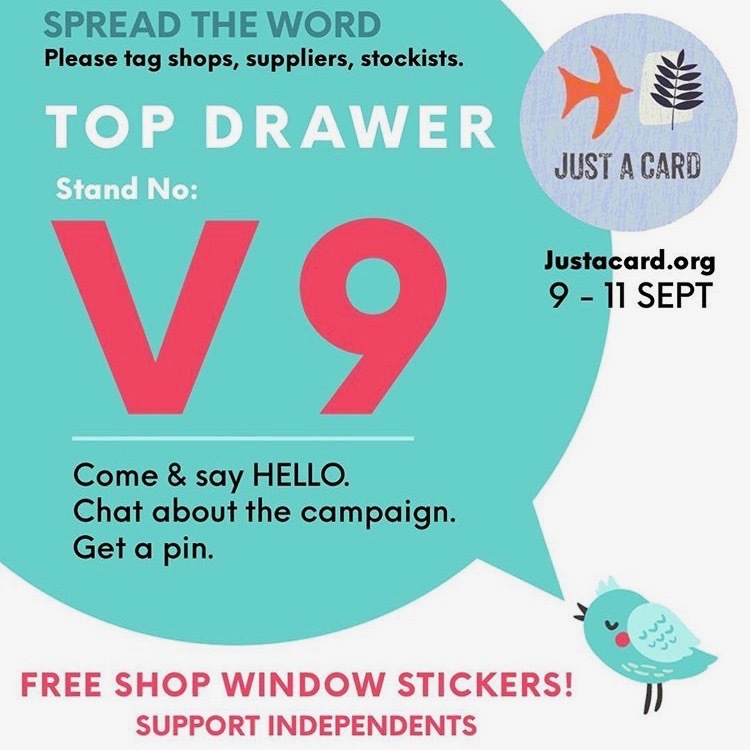 Top Drawer have been incredibly generous once again by giving us a stand, enabling us to hand out our shop window stickers. The Just A Card stand will be even bigger and better this time though, as we will be selling our hugely popular pins and our brand new car window stickers too! 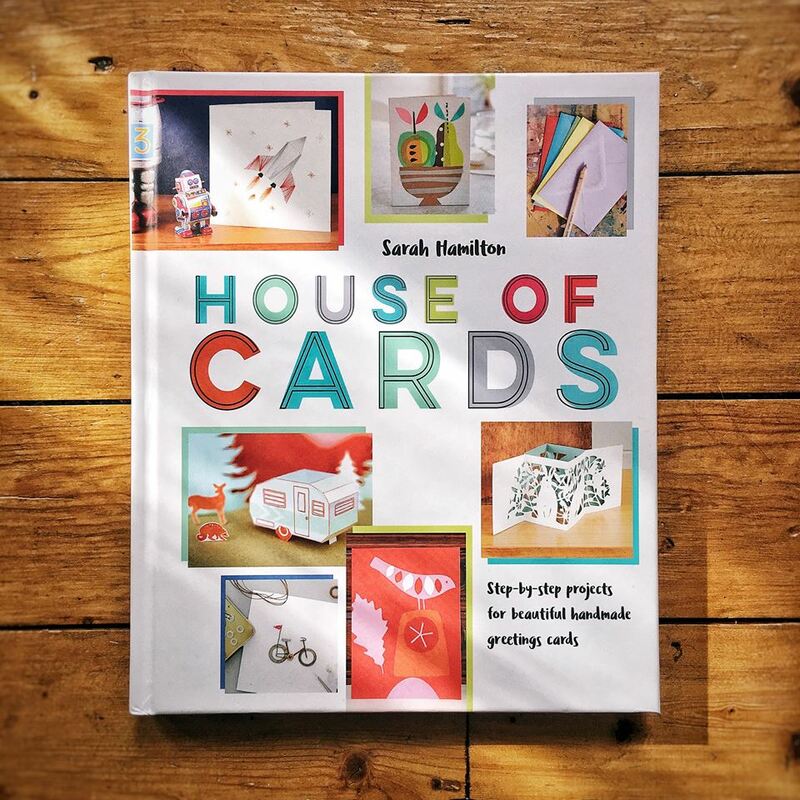 In addition to this we will have copies of Sarah’s book, House of Cards to raise much needed funds for the campaign – so do make sure you pick up your copy. We know that lots of you visit Top Drawer and I and the rest of the team can’t wait to meet you all! Visit us at Olympia London from this Sunday 9 September until Tuesday 11 September. Learn more about the event and register here*. You’ll be able to find us on stand number V9. We had such a brilliant time at Top Drawer in January and it’s a fantastic opportunity to chat about the campaign with like minded people!! If you visit on Sunday do head to the RetailFest area from 4.15pm where Sarah will also be hosting a panel discussion “from part time hustle to full time loving life – learn how to make money from your passion in design”. This is set to be a really interesting and inspiring session! Please note that we will be handing out the new improved shop window stickers – so if you collected one from us in January and would like to replace it (the new ones are easier to read!) please do drop by and see us. If you’re unable to attend Top Drawer remember that our pins, shop window and car stickers are available here (although do bear in mind that the pins tend to sell out fast!). *Please note that Top Drawer is a trade only event and you must register in advance.